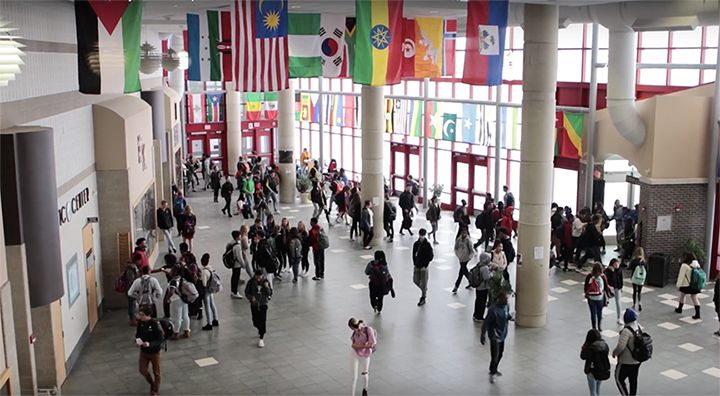 According to East Kentwood High School students, their school is successful at producing future leaders and intelligent students. The Mosaic Film Experience and East Kentwood High School’s Falcon News Network class recently collaborated on a creative educational video project that not only taught the students technical filmmaking skills but also provided them with an opportunity to share their unique stories. Mosaic’s Vice President Derk Baartman and Program Director Elizabeth Merriman initially met with students to kick-off the project. The students wanted to show the world what it’s like to thrive in a diverse community like East Kentwood. From there, students met for several sessions to create a refined vision for their piece, including the exact footage and interviews to film. “Throughout the project, we provided feedback and were very impressed with the students’ vision and work,” said Merriman. When the students were ready to film, Carbon Stories provided feedback and mentored students during a day of recording interviews and b-roll. Kentwood Superintendent Michael Zoerhoff agrees, sharing that he thinks Kentwood is one-of-a-kind. The collaborative East Kentwood project exhibits the technical skills students gleaned from The Mosaic Film Experience and uses the power of storytelling to share the positive impact that embracing each other’s differences can have on a community. At East Kentwood, we are family. We are the world.